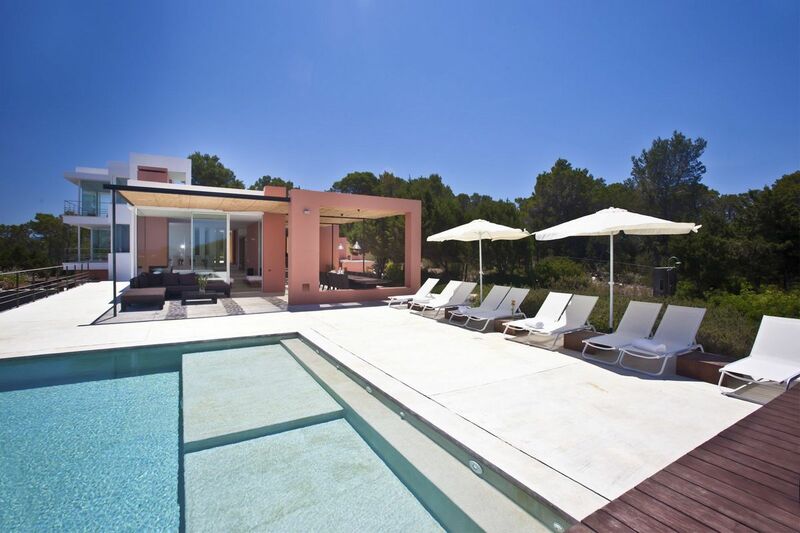 Ibiza villa rent accommodations: 6 bedrooms, 6 bathrooms, 12 people, pool, garden, Wi-Fi. 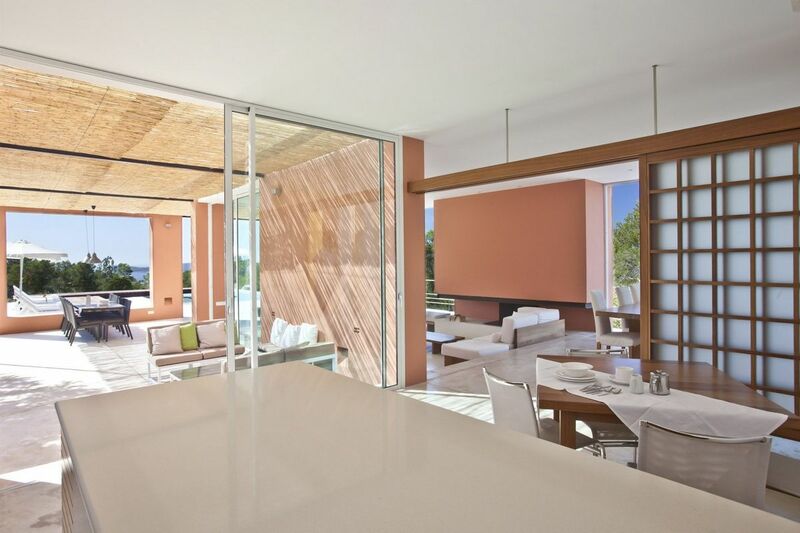 Ibiza villa rent surfaces: 400 sqm, park 37,500 sqm with maritime pinewood. 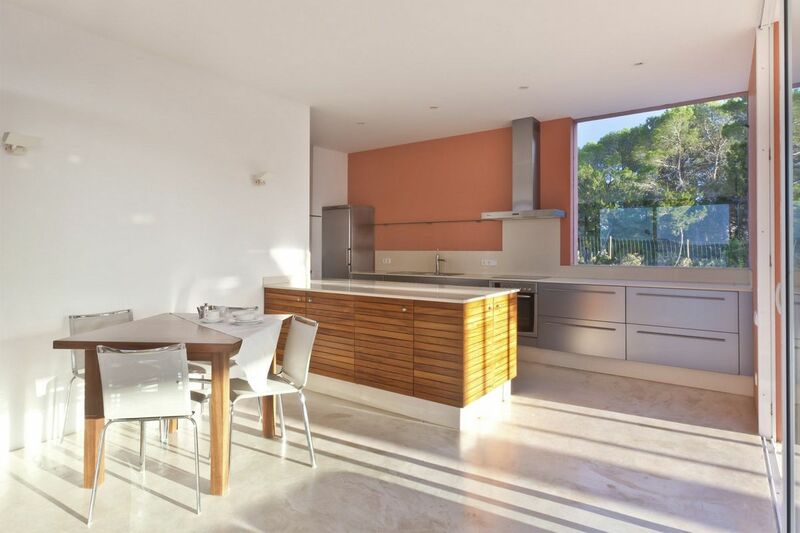 Large windows allow the sun to illuminate the Ibiza villa rent, which is in perfect harmony with the surrounding nature (it seems that the pinewood is part of the house). 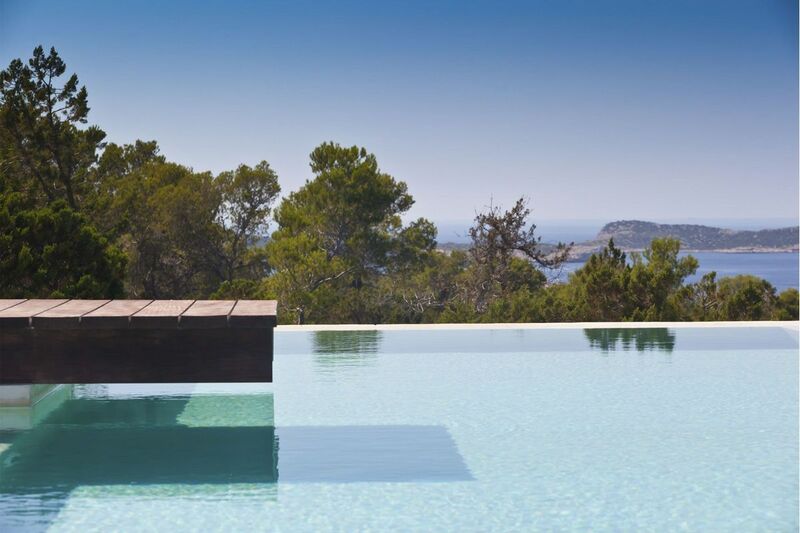 The turquoise sea is always on the horizon and the island Conejera and the Tower of the Pirates are just opposite the stunning infinity pool of this Ibiza villa rent. Contact us for further details. 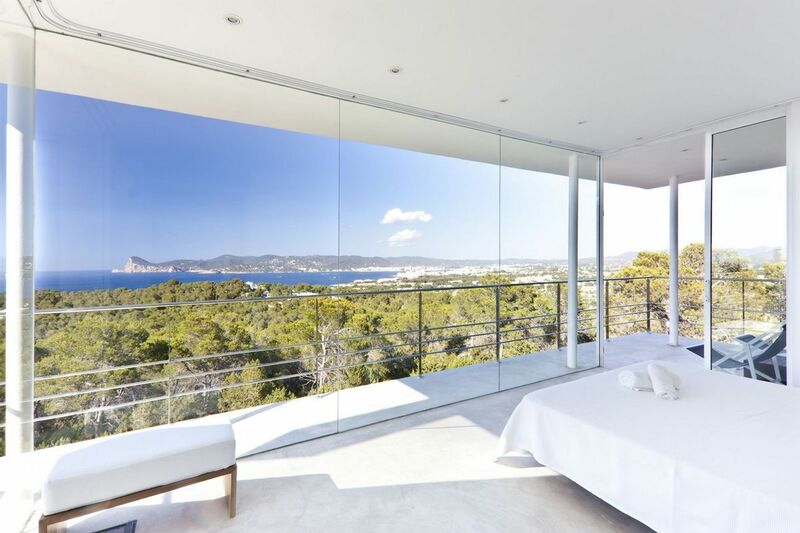 • Ibiza villa rent – Master bedroom: with en-suite bathroom and private terrace overlooking the sea, at the top level. 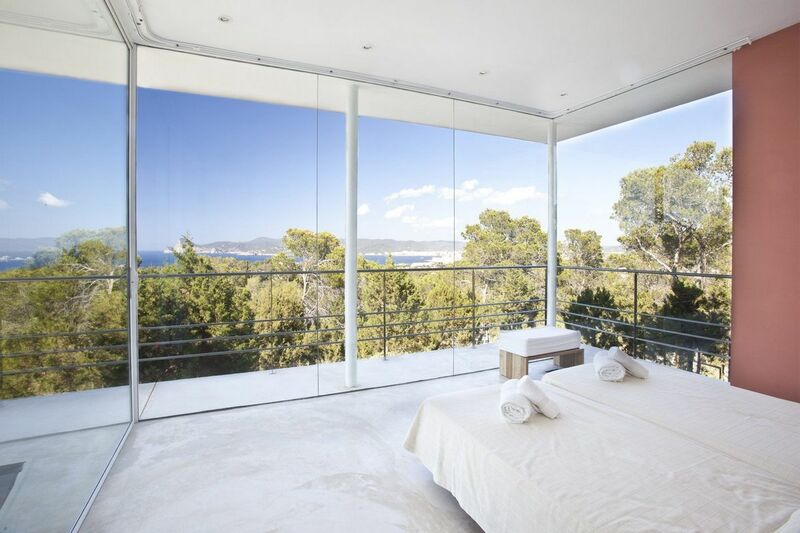 • Ibiza villa rent – Bedroom # 2: with bathroom and private terrace overlooking the sea. 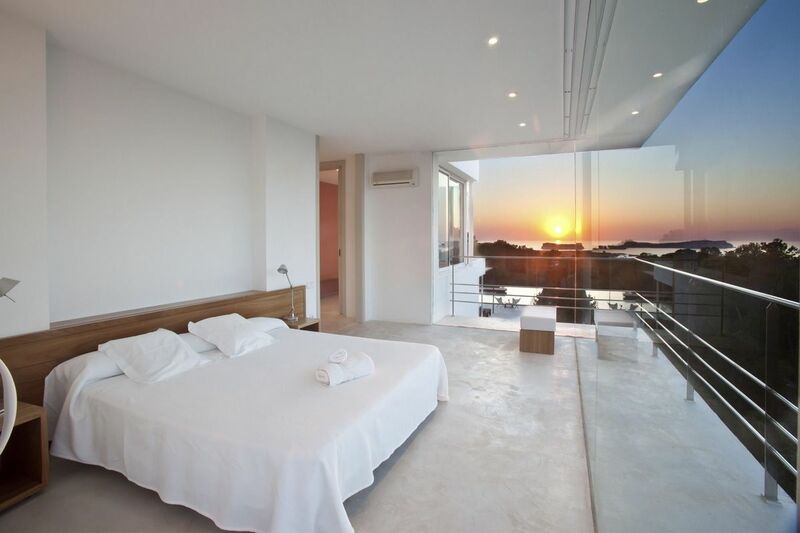 • Ibiza villa for rent – Bedroom # 3: with a bathroom, on the ground floor. 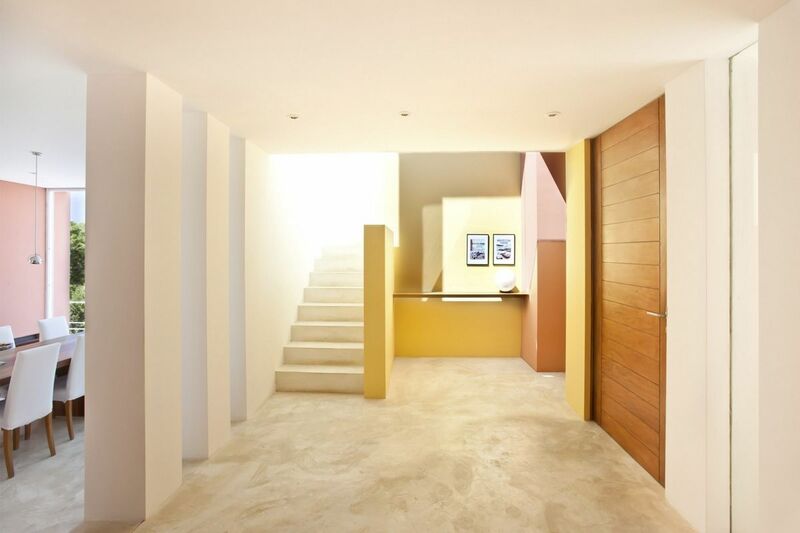 • Ibiza villa for rent – Room # 4, # 5 and # 6: with bathroom, in the basement. 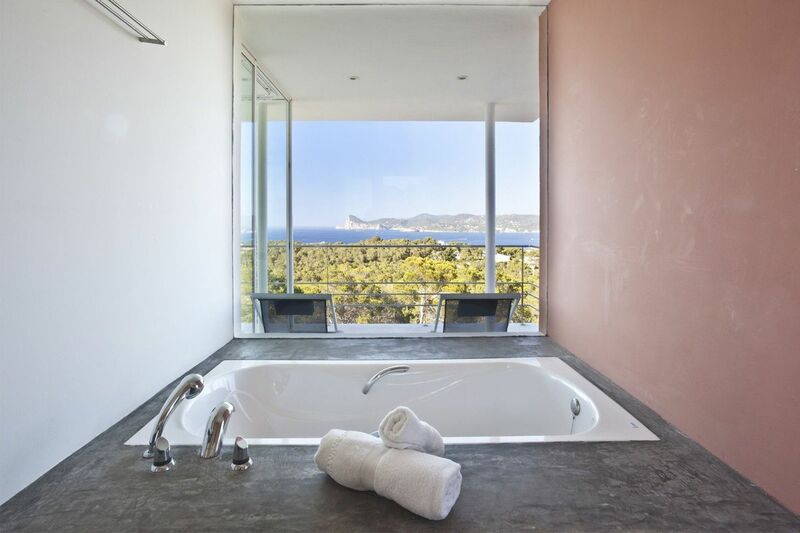 • Ibiza villa for rent – Master Bathroom with bath, large shower, sink and toilet. 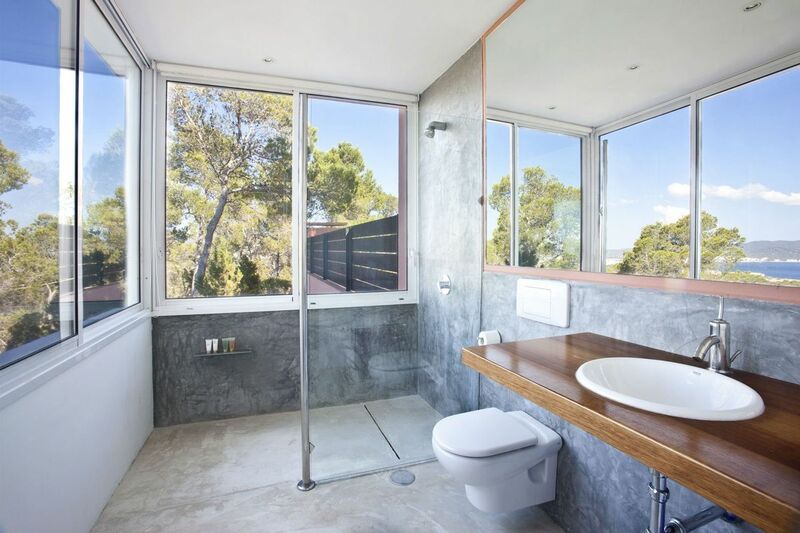 • Ibiza villa for rent – all other rooms with large shower, sink and toilet. 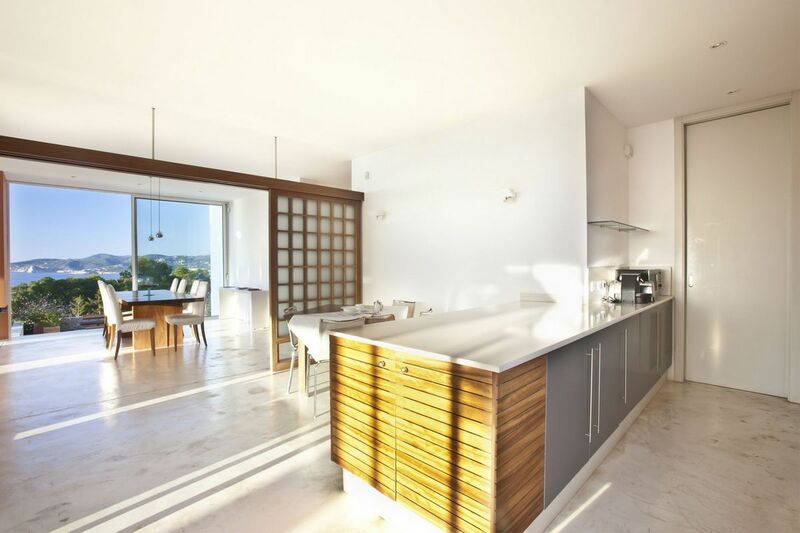 The kitchen of this Ibiza villa for rent is very bright, connected to the living room and the dining room with large sliding glass doors and also connected to the pool terrace. 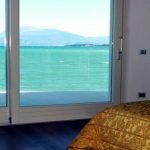 It is fully equipped with fridge, freezer, oven, microwave, dishwasher, Nespresso coffee machine and variety of tableware, glassware and cutlery. 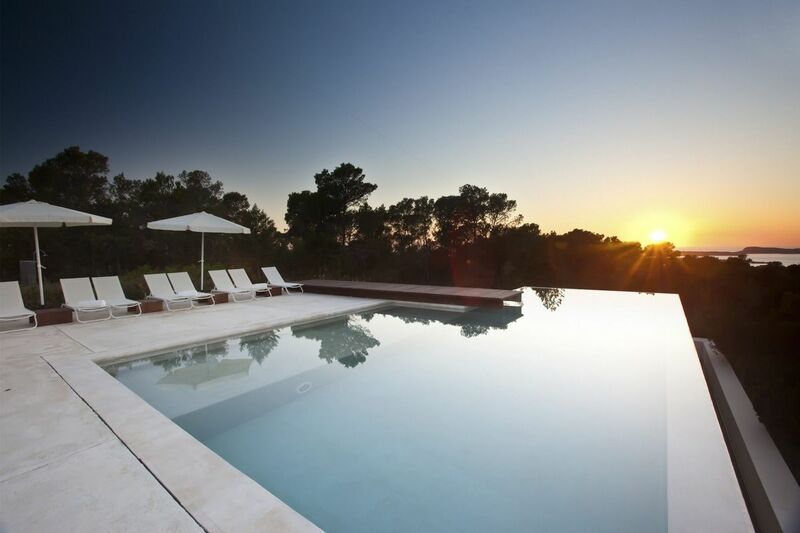 This Ibiza villa for rent has an utility room equipped with washer, dryer, iron, ironing board, cleaning equipment and clothing for the service staff. 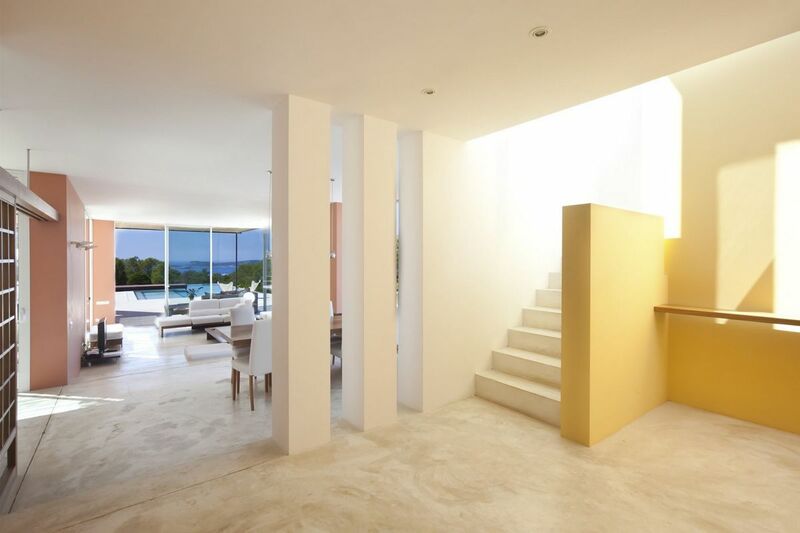 The living room of the Ibiza villa for rent also includes the entrance and the dining room. 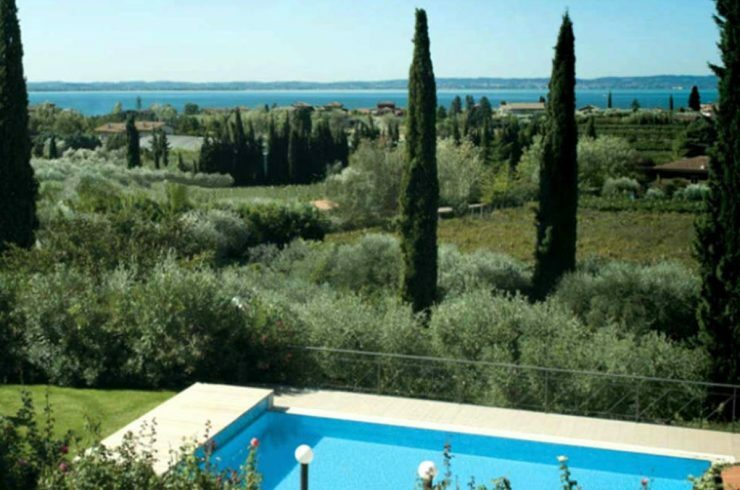 It is a large open space communicating with the outside terraces through glass doors. 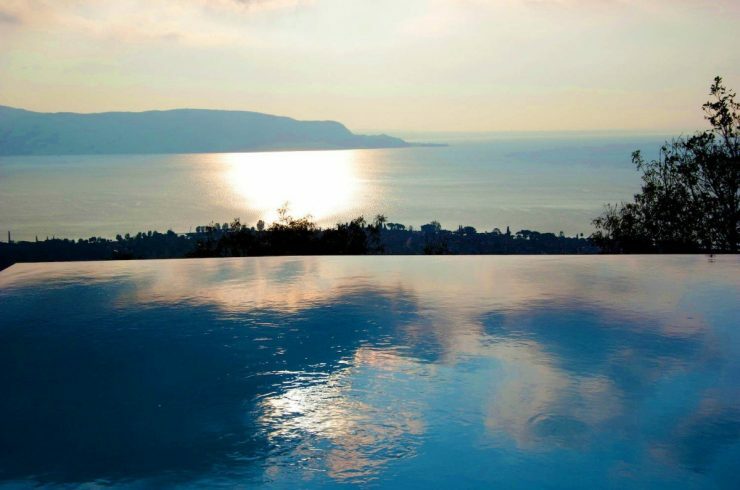 A large glass wall opens to the pool area and the sunset view. 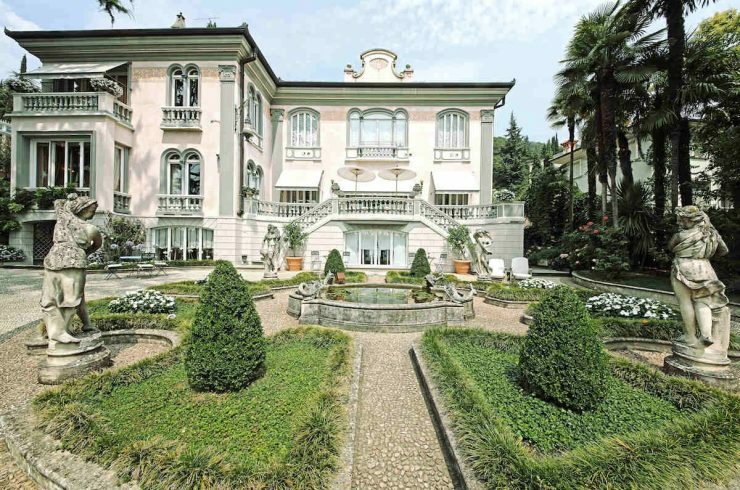 In the living room there is satellite TV, DVD, Hi-Fi, Wi-Fi. 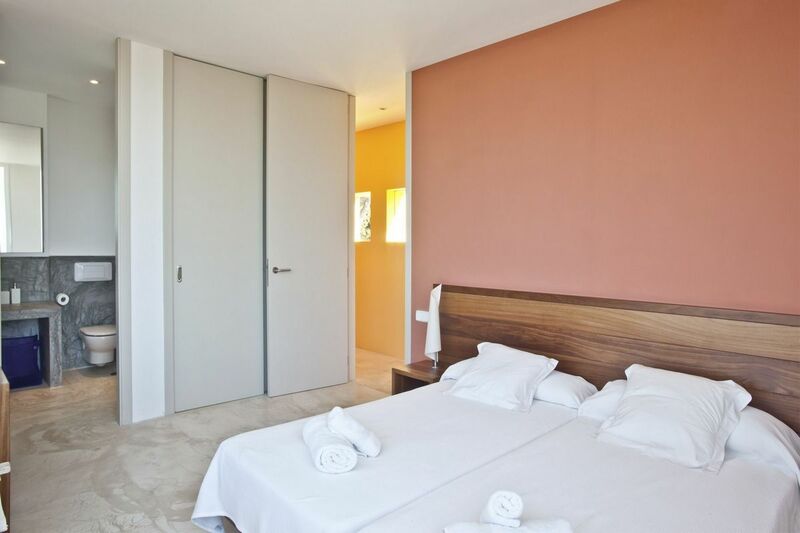 Rooms #4, #5 and #6 of this Ibiza villa for rent have an exterior independent entrance, making them ideal to accommodate a nanny, housekeeper or caretaker. 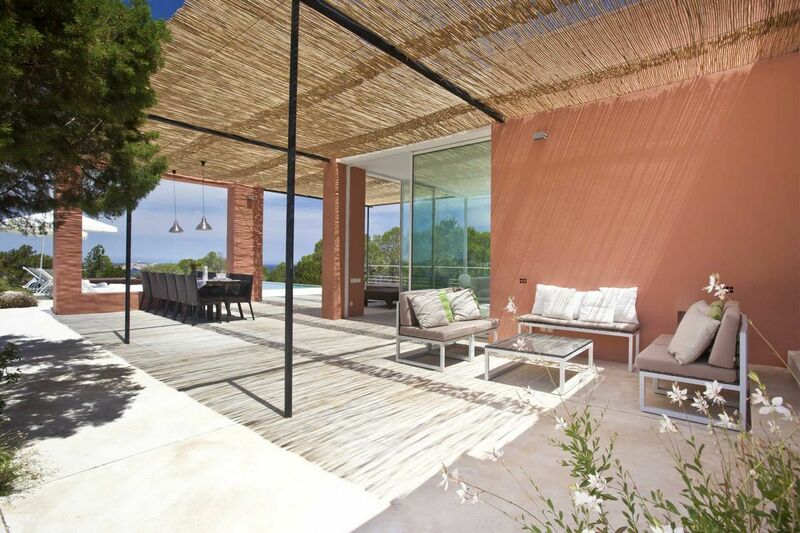 This Ibiza villa for rent, located in a protected marine park where nature is lush and green, is hidden in a pinewood on top of a hill that provides privacy and protection from prying eyes. 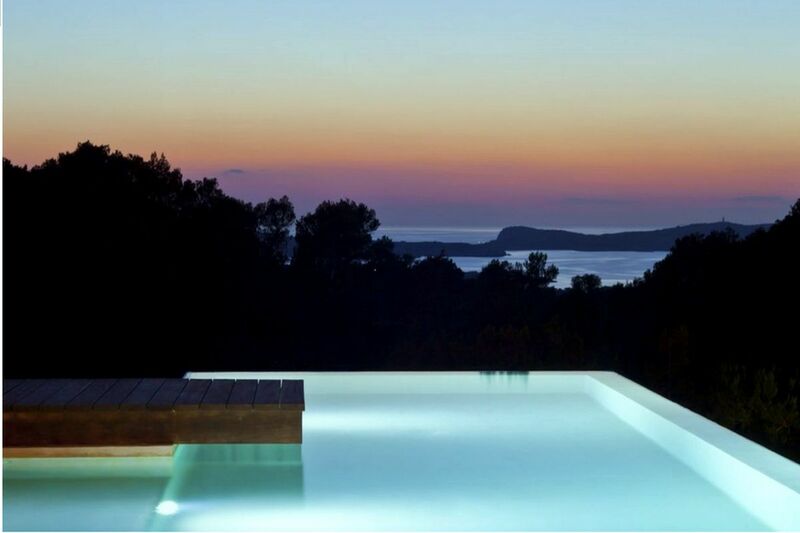 From every corner of this Ibiza villa for rent you can admire a landscape that looks like a painting hanging in the sky, and the sunset seems a daily show. 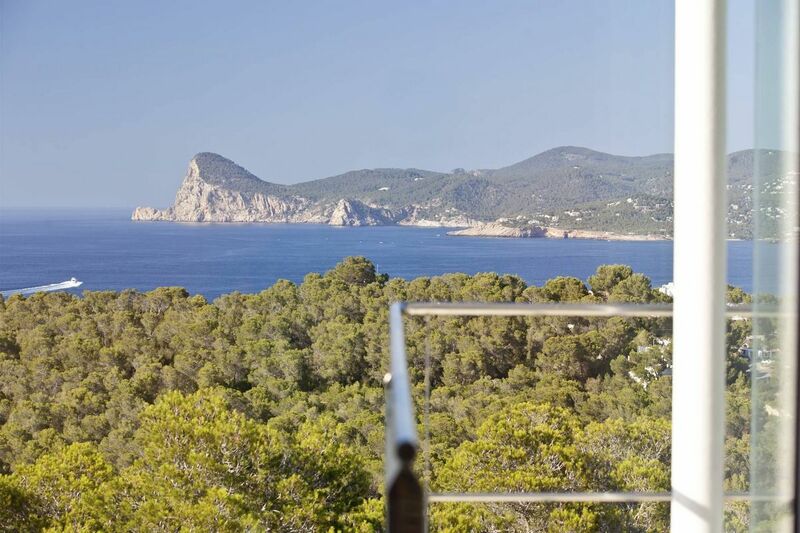 Very often, the coast of the continent can be seen from the Ibiza villa for rent. 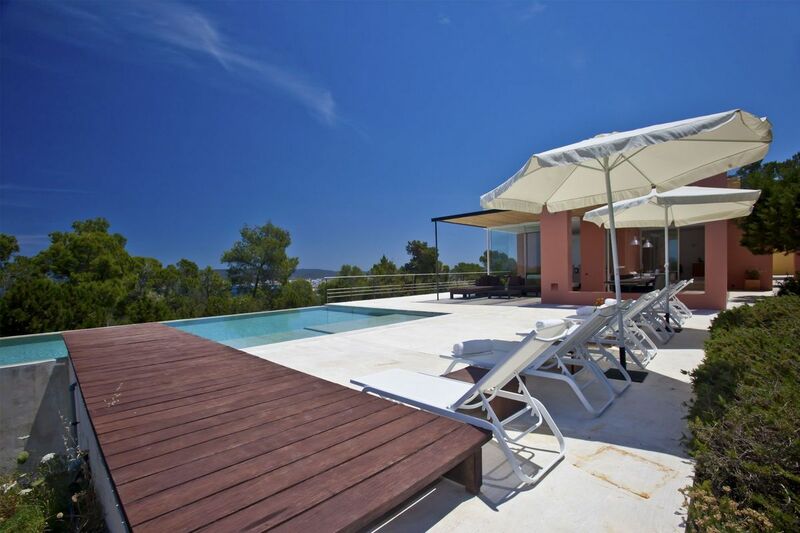 Unfortunately this Ibiza villa for rent is not accessible by disabled people. 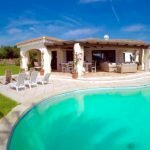 The weekly prices of this Ibiza villa for rent includes: 4 hours of cleaning per day (not on Sundays and national holidays), gardener and pool maintainer three times a week, abundant supply of pool towels. 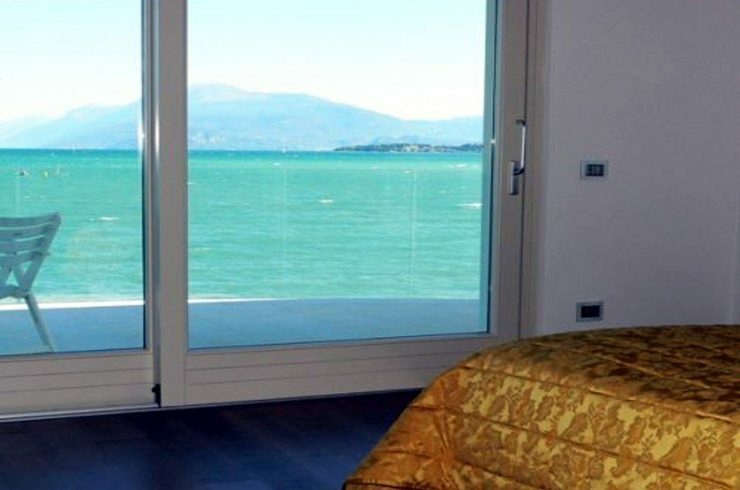 Bed linen and towels are changed as needed. 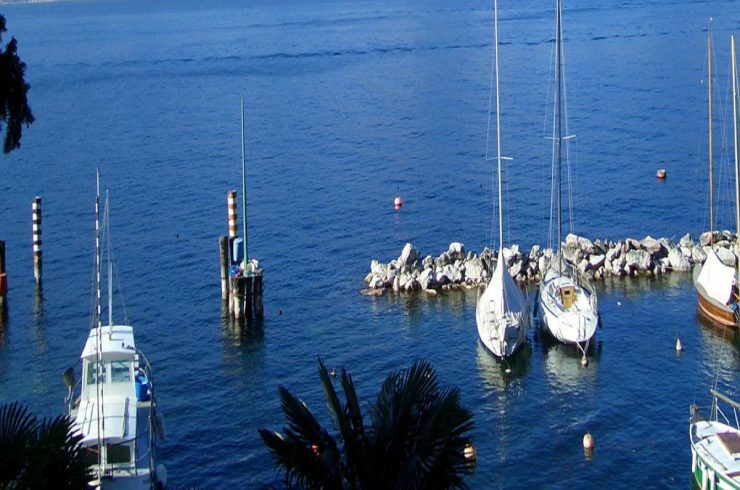 Spain is a land with Latin charm, bathed in sunshine all year round and rich in traditions, history and culture. 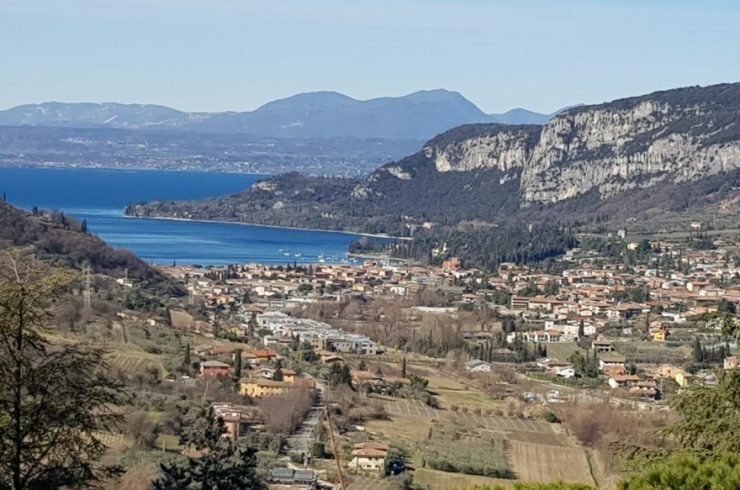 As in Italy, the quality of life in Spain is very high thanks to the centuries-old tradition of food and wine, the hospitality of its inhabitants and its generous nature. 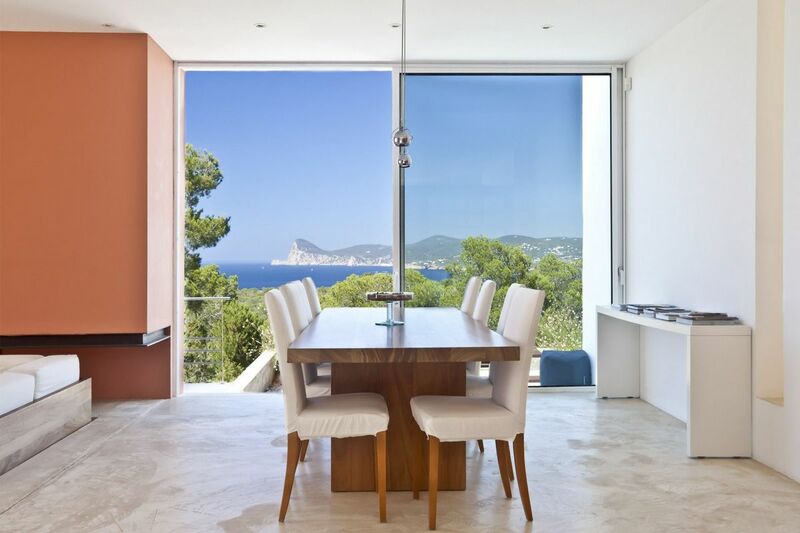 To offer a high quality of life and great investment opportunities, we focused on three magic Spanish areas: Balearic Islands, Andalusia, and Catalunya, where you can find wonderful luxury houses for sale and for rent, like this Ibiza villa for rent. Contact us for further details. 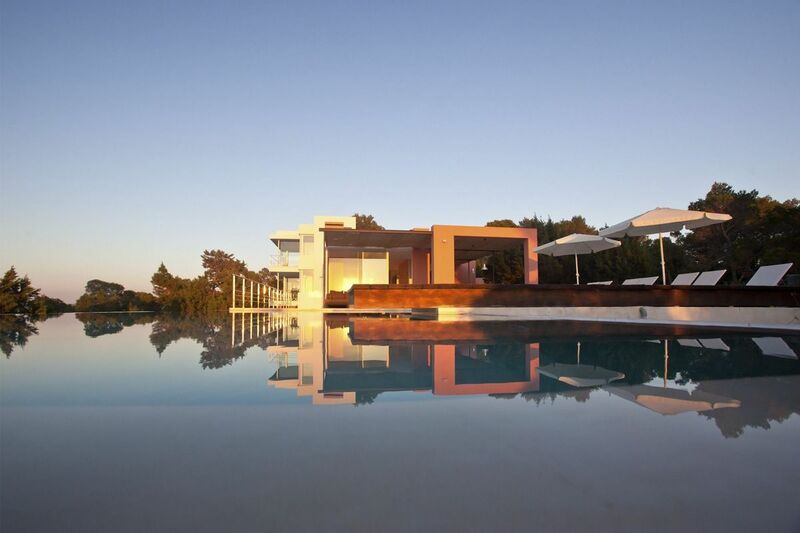 • distance of Ibiza villa for rent from the golf course: Roca Llisa (20-30 minutes). 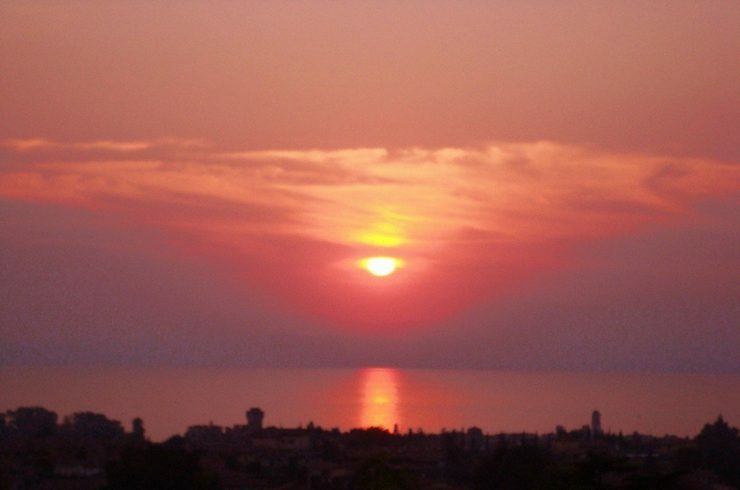 In Spain the weather is mild and pleasant almost all year round. 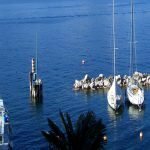 The Balearic Islands are called the “Islands of Eternal Spring”, because the average annual temperature hardly drops below 18 degrees. 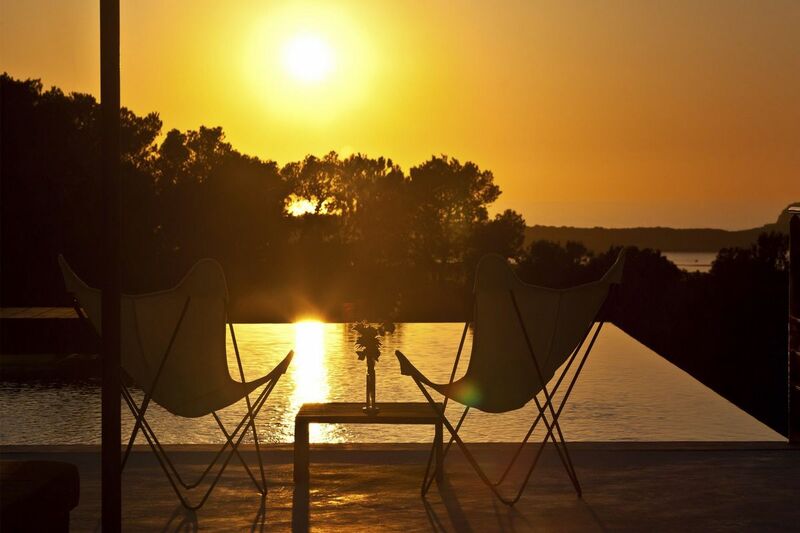 You’ll enjoy your Ibiza villa for rent all year round! 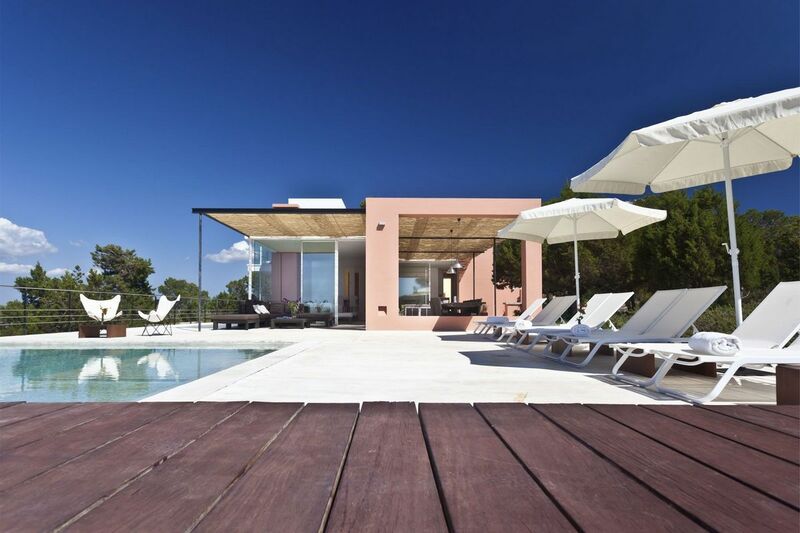 Further than this Ibiza villa for rent with minimal design, with our help in Spain at Balearic Islands you can find your luxury house for sale or for rent in one of these dream locations: Formentera, Mallorca, Menorca. 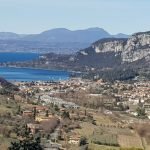 Contact us and we will make for you a targeted search according to your needs. 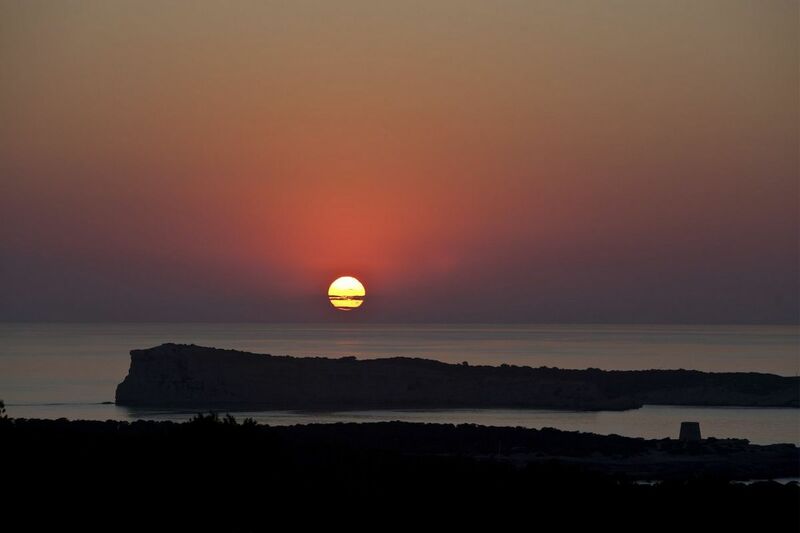 Everyone dream to visit Ibiza and, once they have visited the island, they want to stay as long as possible. 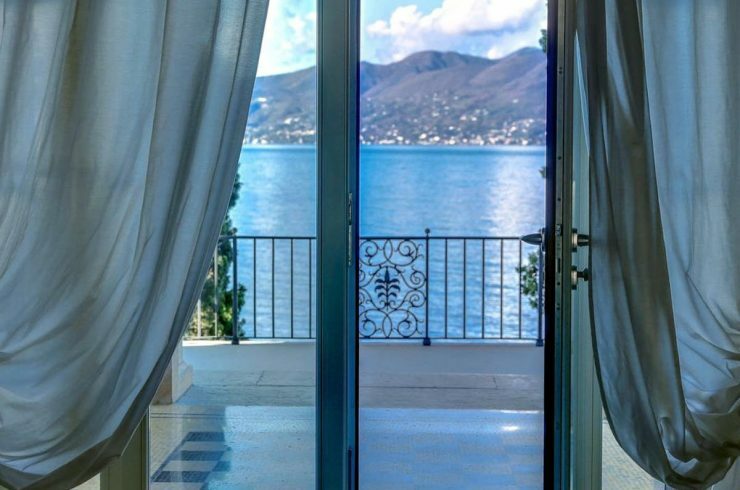 Island fever kicks in and you just don’t want to go home. 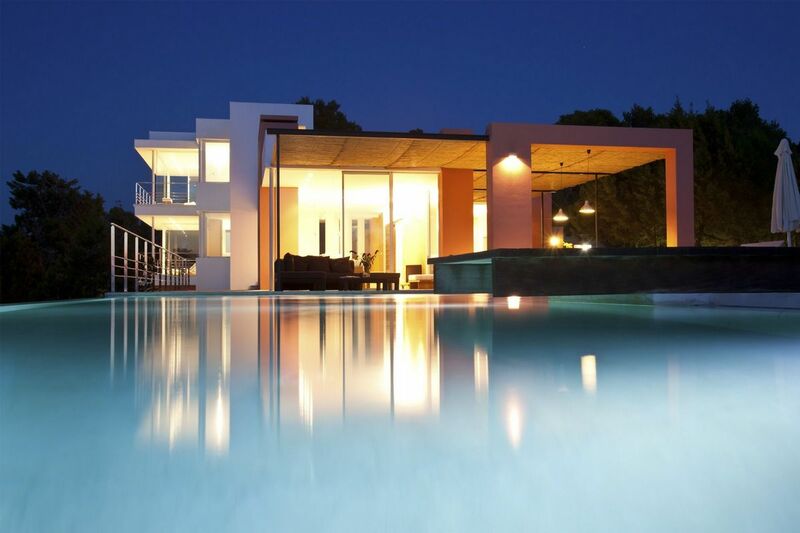 But sadly for most people they have to return to realty and back to their job and life… But some lucky ones, buy a luxury villa like this Ibiza villa for rent and come back every time they need to rest and recharge in the magic of Ibiza.